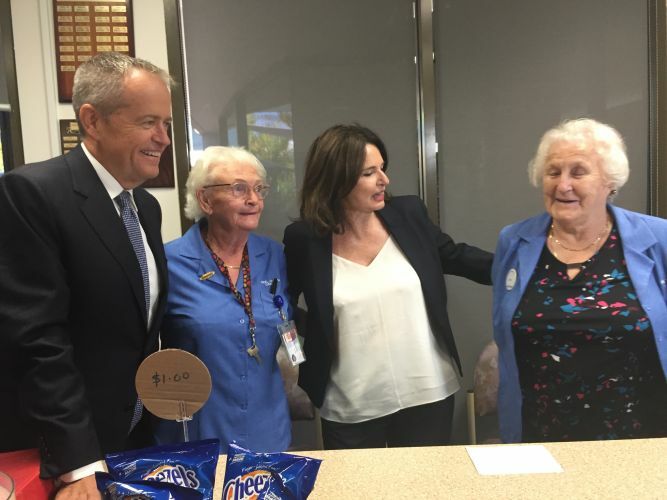 Labor leader Bill Shorten and Canning Labor candidate Mellisa Teede chat with hospital gift shop volunteers Pat Robinson and Edna Prout during their visit. A LABOR Government would help WA combat the ice scourge by funding new drug, alcohol and mental health facilities in WA hospitals. In Mandurah today, Labor leader Bill Shorten said $6 million out of a $20 million investment would be spent on a 10-bed withdrawal unit at Peel Health Campus. He said ice was an issue that must be addressed not just because of the damage to users but because it also drove crime and contributed to poor mental health and domestic violence. He said medical withdrawal units provided drug stabilisation services and helped with the transition to ongoing treatment. The $20 million investment will also fund a 10-bed withdrawal unit and mental health emergency centre at Midland ($4.6 million), a mental health emergency centre in Rockingham ($5 million) and an alcohol and drugs urgent care clinic at Sir Charles Gairdner Hospital ($4.15 million). The projects stem from the recommendations of the final report of the WA Government’s Methamphetamine Action Plan Taskforce.